Horse races have been held in San Lúcar de Barrameda since 1845. It takes place in two stages over three days in August, the dates depend on the tides. 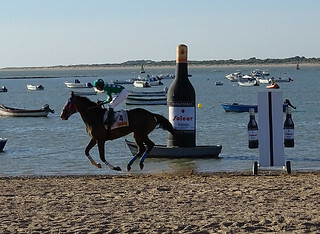 Every day four races starting around 6:00 pm are held at this 1.800 metre long sandy beach. Everybody can bet, there is the official stand for the bookmakers, but there are also amateur stands where people can place bets from as little as 10 cents. One of the stands for betting, run by children. San Lúcar de Barrameda is situated at the entrance to the Doñana National Park and is famous for its Manzanilla wine. A lot of spectators and well-known people visit the village at this time. For those interested in horses, fishing villages & natural parks, this is a very interesting event to know.